"You can add chopped pepperoni, leftover cooked chicken or turkey to this already hearty pasta dish." In a large bowl, combine the pasta, eggs, mozzarella cheese, Parmesan cheese, bell pepper, green onions and parsley. Prepare the dressing by mixing together the mayonnaise, vinegar, Italian seasoning and pepper. Pour dressing over pasta mixture and toss well to coat. Refrigerate until chilled and serve. 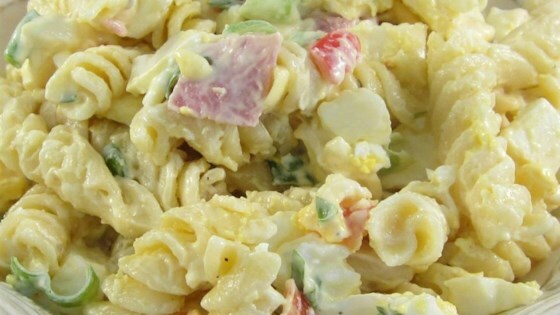 A quick and easy salad with rotini pasta and vegetables. Tried out this recipe for Thanksgiving. Great...different taste. Everyone loved it. This was really delicious and the whole family reall enjoyed it! Thanks for a great recipe!